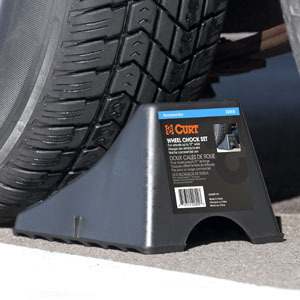 CURT wheel chocks allow you increase safety and stability by adding support to your trailer. Whether you've just reached your destination or you're returning home, CURT wheel chocks can be used for your trailer or vehicle. They are constructed from durable, hard plastic and offer a generous 17" width. They feature a raised tread and saw-tooth edges on the base for better traction on the ground and can be used with a variety of wheel and vehicle sizes, though they should not be used for commercial applications. For even greater safety and security, the CURT wheel chock lock allows you to lock down your trailer or vehicle while it is left unattended. The lock is key-operated and features an expandable width, allowing it to fit a variety of wheel sizes. It is especially useful at the campground or boat landing when you leave your trailer and vehicle for the day. The CURT wheel chock lock comes with three keys and has a durable powder coat finish with rubber-dipped arms to easily outlast rust and prevent scratching on your hubcaps.